Even though I announced it here in March, I finally put up a post at the BBAW site about ending BBAW (Book Blogger Appreciation Week). It's so weird because even though I really made this decision a long time ago, and I KNOW it's the right decision, both times I've written these posts I've felt so sad and nostalgic. I think part of it has to do with how much blogging has changed. When Ana and I hosted a Halloween swap this past fall, we were both surprised by the relatively small turnout. And that's a consistent pattern for any community type event or meme I've tried to host in the past year. It's just not the same place or my place in it has changed. When trying to figure out if Film Club was still something we could do, Sheila mentioned that it comes down to FOMO in a lot of ways. That's Fear of Missing Out for those who don't know. She says she sees it online and also in real life. People are just very very hesitant to commit to anything nowadays because they don't want to end up missing out on a better offer later. This makes me so sad. And also it's kind of insulting to anyone who plans things in advance out of consideration! I don't listen to much new music at all, unfortunately, I listen to like the same stuff over and over. 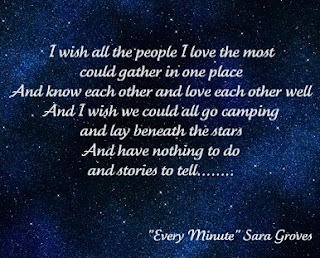 When I was writing about The Americans, I wanted to use some of Sara Groves lyrics and that like opened a floodgate to listening to her stuff all over again like it was brand new--I'm not even kidding! (it's not. Brand new. And it's certainly not brand new to me!) But there are few lyricists who I really admire and feel like...I don't know see the world as I do and are able to capture it in words that are both revelatory and familiar. Words that feel like they came from deep inside of me even though I didn't write them. 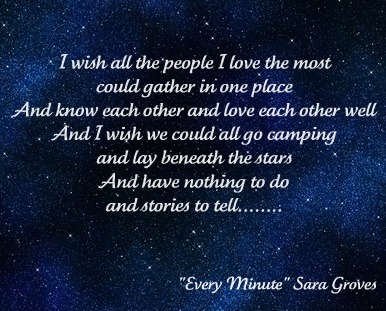 This song, "Every Minute", is from Sara Groves 2002 album All Right Here. Hahaha yes it is that old. Still one of my favorite songs. It's a song about spending time with someone, really spending time with them. It's a song that both mourns the loss of the way relationships used to be and talks about the dangers in really letting yourself be with someone. When I was junior high/early high school I did this thing called Bible Quizzing. Yeah no sports for me, just Bible quizzing! Which was basically a (surprisingly really competitive) program where we learned a book of the Bible and then once a month we'd drive to a church in our district and have a meet. The questions were super specific and by the time the finals rolled around, you'd know from one or two words out of the quiz master's mouth what question they were going to ask. I only went all in one year, and was so crushed in the finals (which were basically what determined who went on to the nationwide competition) that I can still feel the pain of that defeat in my heart! Anyway, the group from my church was pretty close and we had a Christmas party/slumber party at our coach's house. We went Christmas caroling in her neighborhood and came to this elderly ladies house. She was delighted to have us and told us it meant so much to her, she'd been so lonely and worried about Christmas this year. She couldn't even get her decorations down, she explained, they were up in the attic and she couldn't manage it. She was kind to us and I think we all really felt for her. We went home, baked some cookies for her, and the next day went back to offer to help her decorate her home for Christmas. When we returned, though, she seemed quite different. She thanked us for the cookies, but insisted everything was fine, and she was fine. The return visit was short, and we left confused. I was still young and I hadn't learned this really important thing about life yet, that my quiz coach offered up. "Sometimes," she explained. "When people allow themselves to be really vulnerable, they feel embarrassed about it afterwards. She was protecting herself." It's so hard to really get to know one another in our time. We put up so many walls and by the time we reach adulthood we've learned to play games in our relationships with others. At some point in our lives, we're rejected and that rejection is going to be painful enough to alter the way we interact with people in the future. (being stingy with our love as Ana recently put it) It's maybe even part of the reason that we get busy and worry about the latest and greatest thing we might be missing out on..filling our lives with activities rather than each other. And also....well we're human and it's our natural tendency to get what we can out of things, including people. I mean I know this all works together. But anyway, that's what I love about this song. "At the risk of wearing out my welcome," Sara Groves sings, "At the risk of self-discovery." "I couldn't think of one thing I'd rather waste my time on than sitting here with you." Aw I love this because it speaks to being fully present with the people we are with and not worrying about missing out on other things. But my favorite part is of course the bridge which I have up there in that rudimentary graphic. Because YES. The longer you live and move around and the more people you know, the more people you love--your life becomes fragmented. Parts of you are everywhere and there's just this longing to connect those pieces..and to connect all the wonderful people you know and love together. I hate camping, lol, but nothing in the world sounds better to me than having all the people I have ever deeply loved together and telling stories and loving each other well. I think this is what heaven is like...a place where the fragmented pieces get sewn together into something whole. Anyway, this is one of my favorite songs in the world and just writing this has made me really teary. It's a song about the whole acceptance and joy of another person's company..."always know that you're invited my friend." Anyway, I've embedded the video for anyone who wants to give it a listen...the style might not be to your taste, tbh, but ugh I love her so much.